The world is riddled with “wannabe” artists. People who base their whole musical existence on writing cliché music, boring lyrics… and complaining when they don’t have any success! Now, you may think I’m being a little rude. Let me assure you, I’m not. It actually saddens me to see this happen, and I’d help every one of these musicians if I could. But since that’s never going to happen, I want to concentrate on helpingyou. You’re here because you want to develop. You want to push past this stage of being a “wannabe” to the stage of being something truly special. The type of artist that the world celebrates and cherishes. It’s absolutely POSSIBLE to QUICKLY move into this “special artist” phase. And in this article I’m going to give you one of the keys. There’s a few things that these “wannabe” artists have in common (By the way, I’m really not poking fun here… I just don’t have a better word to use right now). What I’m talking about is this: The majority of musicians don’t have anyvision for their music. They simply go along basically half copying other artists, sticking to clichés and swiping chord progressions. Because of this, they never write anything very inspiring, and therefore go nowhere. But when it comes to actually creating, they have no idea what they want to do. They don’t have an end goal in mind. A vision for what their music could be. On the other hand, there’s a young lad who lives locally here in Adelaide who has limited ability on his instrument, but he has strong opinions about the way his music should sound. He knows what he’s trying to create. Therefore he moves straight towards this. And as a result he’s making big waves with his music. He’ll put a youtube video up of one of his new tracks, and thousands of loyal fans will immediately watch his video and glow over the new track. This is the type of musician that will go far… This is the type of musician who becomes something extremely special. Do you have a VISION for your music? Do you have a strong opinion about how your music should sound? If you were to put out an album next week, could you tell me what it would be like? If so, wonderful. Cherish this vision. Constantly review it and plot to make it a reality. Move full steam ahead and you will flourish as a musician. Right now we’re going to begin developing a powerful vision that will move you towards your goals as a musician. Firstly, here’s one of the most important questions you can ever answer. What is perfect music to you? Write everything that comes to mind. Allow your intuition to guide your answer. Come on… you know that you have strong opinions about music. Every musician does. These opinions are going to lead to you creating something unique and wonderful. Now is the time to get these on papers and begin THINKING about them and USING these opinions to form GOALS that you can pursue in your music. Also, bring your favorite artist to mind. And ask the question. Is this music perfect? I bet as much as it pains you to say, there’s another “ultimate style” out there that you’ve maybe never heard, but would be BETTER than this artist that you love so much. Write down three things that would make this artists music BETTER. These answers come from inner programming that exists deep in your mind. These answers say a lot about the way you think about music. And it’s these ideas that you need to let GUIDE you towards creating your “perfect music”. This vision you’re creating… this idea of “perfect music”… if you can actually go out and create this, you will be highly successful as a musician. People will happily pay to buy your CD’s… watch you play… even buy merchandise from you. They will discuss you with their friends for hours on end. They will listen to you late at night, in the car on the way to work, and when they hang out with your friends. Your own idea of “perfect music” is the thing that can unleash tremendous success for you as an artist. Also, an extra benefit is when you begin writing songs that fits this criteria, YOU will LOVE your music above anything else. Sitting and listening to your creations will bring you pleasure and enrich your life tremendously. Ok, your probably beginning to get an idea of the music you want to create. The next question is, how can you take this vision and actually create it? Well, it probably seems like a tough ask at the moment. You have in your mind an idea of spectacular music, but how on earth will you create it? 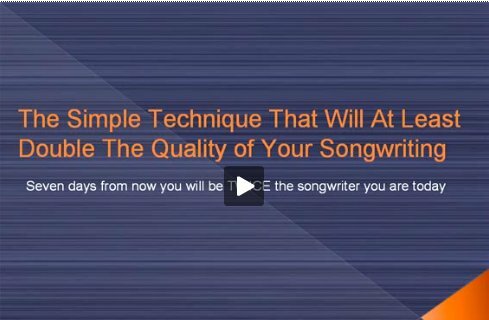 Well, I’ve released a songwriting course that shows you exactly how. This course is designed in a way that will allow you to take your “perfect music” and move directly towards it. It uses special techniques that allows you to tap into resources deep within you mind… something that rarely happens in the majority of musicians. Using these techniques you will be able to create ideas that match this idea of “perfect music” you’ve just uncovered. It’s all about having a method that can “draw out” ideas that supportsyour vision… And with the use of special exercises that use “accelerated development” principles, you can very quickly build up a large body of ideas that will allow you to fulfill this vision. Do so and you will leapfrog WAY over the “wannabes” out there and become a truly special musician.